Based in Lambert Leser’s Troy office, Frank has represented numerous corporate clients ranging in size from small businesses to major manufacturing organizations, including automobile suppliers, construction companies and many types of service companies. His areas of expertise include automotive supplier issues, construction law, shareholder disputes, and the purchase and sale of businesses. In addition to his expertise in business and corporate law, Frank serves as an American Arbitration Association construction and commercial arbitration panelist and has been appointed as an arbitrator in more than 100 cases. Frank has received an AV rating by Martindale-Hubbell. 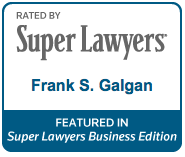 He also was named in the 2013 and 2014 publications of Best Lawyers in America and Law & Politics and in the 2010 editions of Super Lawyers magazine in the area of commercial litigation and Dbusiness Magazine’s Top Lawyers List in the areas of business law and corporate law. He previously was a principal with Beier Howlett, P.C., where he worked from 1992-2013; and Freud, Markus, Slavin & Galgan, P.C., where he was employed from 1968-1992.